Eating out / Food / Kiddie Parties / Kids and Family / Little Discoveries / Mommy Duties / The Wife / To Eat or Not to Eat!? We celebrated the birthday of my MIL at Choi Garden in Greenhills. Before the day of the celebration, i decided to take a look at the room that was reserved for us to see if it needed some decorating. And it did! The room’s walls were all black and it was small. Literally one table for 12 and a small cake table in one corner. The rest of the space was enough for ONE person to walk around the table. Anyway, here I am again being the “frustrated decorator” trying to make a place look a bit livelier with simple things. Nothing extravagant. Mostly DIY stuff. 1. 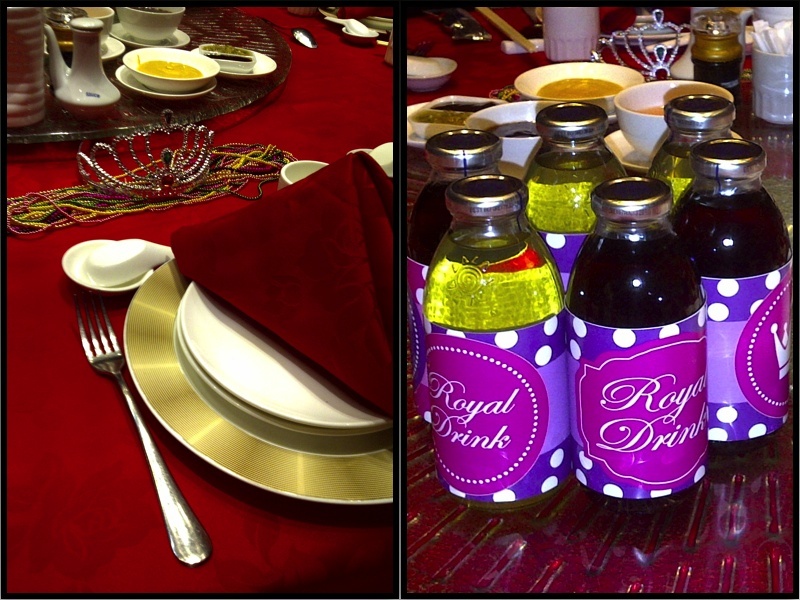 Chose a theme…Royal birthday. 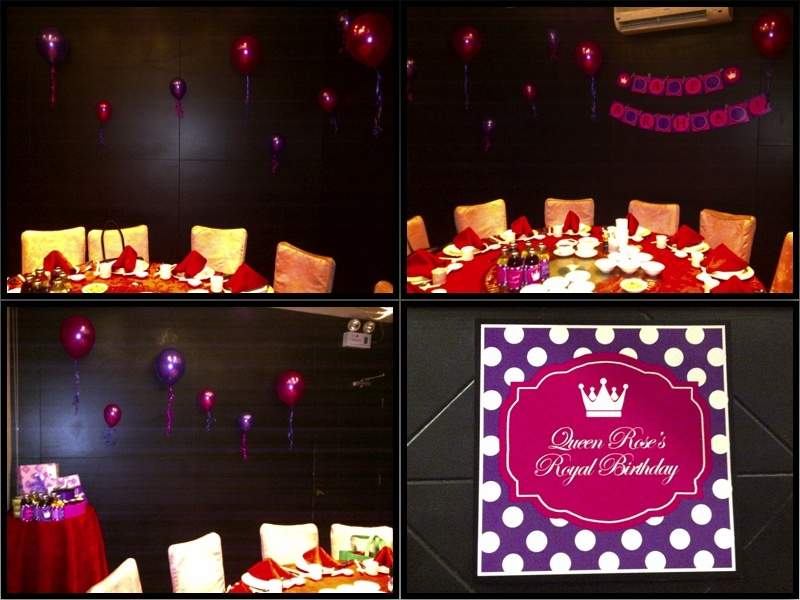 Decors/designs were colored pink and purple and a crown drawing. 2. Got 10 five-inch & 8 eleven-inch balloons with currling ribbons. Only pink and purple. 3. Made a happy bday banner, cupcake toppers, drink labels, and welcome sign. 4. Ordered a small fondant cake for blowing and a bigger strawberry shortcake to serve. Mission accomplished. It really looked better! 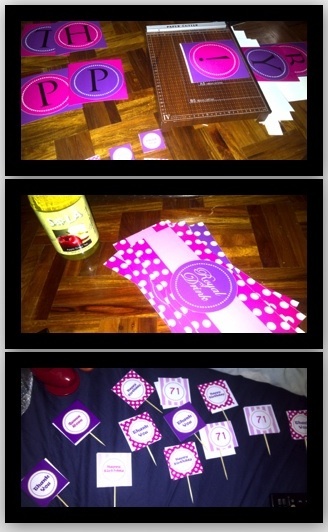 Behind the scenes in making the birthday banner, drink labels, and cupcake toppers. Balloons taped on the black walls, Birthday Banner up, and Welcome sign on the door. Can you imagine how small the room given to us was? 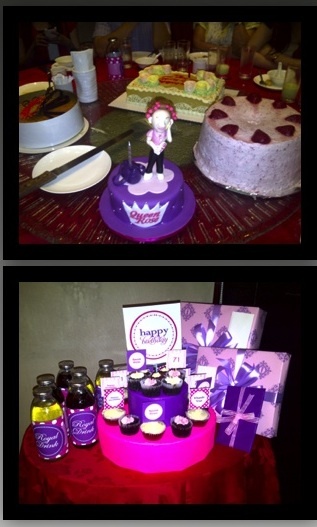 Cakes: Bunny Baker themed cake, Baby Yulo’s Strawberry Shortcake (810-8078), Estrels Caramel Cake (372-2965), and Caramia cake with jello on top (sorry I forgot what the name was). Then mini and super mini cupcakes (Red Velvet and Moist Chocolate) by Roan Ang-Ngo. My mother-in-law said it wasn’t really normal for chinese families to have something like this as they just go to the restaurant, sit down, eat, then go home. No wonder all the waiters and managers were all peeking inside the room and smiling. Maybe wondering what’s this crazy pregnant lady doing!? Some even went inside the room and really looked at every detail. The manager even thought I made the “royal drink” myself not knowing it was just Sola iced tea, lol! Anyway, MIL was happy she felt like a kid again during the dinner with all the decors (well, at least that’s what she said …hehe). She got shocked when she arrived and even asked my brother-in-law why the room looked different from the outside and even left and looked for another room hahaha! Actually, I got shocked coz she was there early! I wasn’t done with the decorating, so I din’t let them go in and closed the door 🙂 Then the bunny baker delivery was supposed to be at the venue by 6pm, but my MIL was already there and still no fondant cake which was supposed to be the centerpiece! …Good thing MIL went to the bathroom, then when she came back, the cake was there. (note to self: always ask suppliers to deliver 1.5hrs in advance). This also made my kids enjoy the dinner…and I quote “Mommy, I’m enjoying the party coz it looks so pretty!”. That coming from my 3 year old 🙂 I’m nowhere near an event stylist but I enjoy doing these little things especially if it’s for people close to me.